Even old things can be improved. Consider a wood axe. Simple, right? Humans have been chopping trees for thousands of years, yet there was undiscovered improvement. This guy has improved the axe to use all that angular momentum to chop wood easier and quicker. Notice the very unusual shape of the blade - it is mean to cut and then rotate to push the sides of the split apart. Each spec file is running in its own Ava test runner instance. This means, whatever one spec file is doing is unaffecting the other spec files. There is no shared memory, or module system - every test runner was spawn as a separate process, isolating the tests from one file from tests in another. The isolation helps with finding inter dependencies among tests, and it also allows to run tests in parallel (which really means "faster"). And it almost happened ;) But the requirement to transpile everything in each subprocess during Node 0.12 and 4 days meant the parallel speed advantages were kind of moot for small "trial" projects. Luckily, today with Node 6/8 the transpile is almost never necessary, and Ava test runs are super fast. Jest test runner has introduced a bunch of features that I love. In particular I am awed by its snapshot testing feature. No longer I have to write many assertions to compare the entire result with expected value; I don't even have to compute the expected value. Instead I just need to say that the computation should match the snapshot. For larger things like DOM component rendering creating the expected value by hand is almost impossible! I loved snapshot testing so much, I really wanted it inside my Mocha tests. While a test runner like Ava just grabbed the Jest snapshot module (see what I mean about test ecosystem tools borrowing ideas from each other? ), I had a strong "Not Invented Here" syndrome. So I wrote my own snap-shot library that can work with pretty much any test framework as a zero-configuration add-on. The snap-shot works without integration with the test runner, and thus it had to overcome a major problem. When a test calls snapshot(value), how do you know the test file and the test name so you can look up the previously saved snapshot? snap-shot works by inspecting the stack trace when it is called and then by finding the spec file, and then by inspecting its AST to find the it(name, cb) statement. You can find details in this blog post and in these slides. By relying on the global functions like beforeEach, I could write a snapshot utility that actually works in any language - because it would find its "owner" test during runtime and not by static source inspection. So I made snap-shot-it - it registers beforeEach callback to grab the current test about to be executed. If the test calls snapshot then inside snap-shot-it it can find the test's name, spec file, etc without any hunting. Beautiful, but why spend so much time writing a utility that already exists? Because I want simple 1 page module that is not relying on a particular framework. I also want to learn and experiment, and snap-shot, snap-shot-it produces another cool collection of tools. By factoring out saving, loading and comparing snapshot values into snap-shot-core I have been able to implement additional features. In summary, snapshot testing is really useful, and now there is a variety of snapshot choices; I described the alternatives. 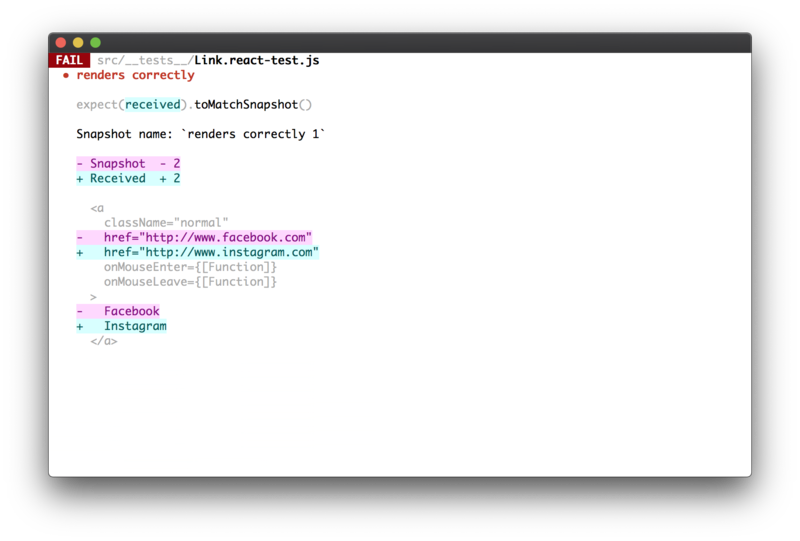 In addition, Jest has another cool feature. It collects code coverage by default (yey zero config!) and thus is able to track which test files cover which source files. When a test or a source file changes, Jest can rerun the affected test files which means super fast feedback loop. Full proud disclosure - I wrote untested 5 years ago (Jan 2013). untested orders your unit tests by code coverage so you can test faster, it even supports browser based tests through lasso. It is kind of cool to see ideas that were prototypes for a long time used in production to test millions of files. update as this twitter thread notes I was mistaken thinking Jest uses code coverage to track test dependencies. Instead Jest uses file to file dependencies. If the test file "a-spec.js" loads "a.js" then when file "a.js" changes, test file "a-spec.js" will rerun all its tests. On the other hand, a test runner like Wallaby.js actually does track code coverage for each test and can accurately rerun only the affected individual tests. Each unit test should be independent from the other unit tests. Easy to say, right? But it is so easy for one test to leave changed global state, affecting the result of another test. In this file, one of the tests changes value foo, making the third test pass. Yet if we run the third test by itself, it stops working, because nothing set foo = 42 before it runs. The flaky tests are hard to debug, because isolating the tests literally breaks it or removes the source of the flake. shuffling 3 unit tests in "example"
Perfect, we caught the flaky test. Maybe not right away, maybe after a few runs, when each run used a different reshufle. But what happens when we try to investigate the problem - will it disappear because the tests will be shuffled again? No. When tests fail, Rocha will save the failing test order, and on next run will set it to be the same again. A developer can rerun the "bad" test order until the problem is discovered and fixed. and now you wait for CI to finish running through the 100 tests just to find out if test #66 that was failing before starts passing again. Wouldn't it be more useful to find previously failing tests first? Similarly to rocha, Focha is a wrapper around Mocha that concentrates on collecting failing tests (the "F" in "Focha"). When all tests finish, Focha saves failing tests (if any have failed) in a JSON file or sends it to a REST api endpoint. "scripts": "focha *-spec.js && focha --all *-spec.js"
Finally, there is Locha - the "L"oud Mocha. Imagine a test that exercises a complex piece of code. That code probably has a lot of logging statements. I love using debug module so I can enable log messages through an environment variable. Being able to easily turn on verbose logging leads to a dilemma - do you enable all logging in CI by default just in case a test fails? That's not good - each test can generate 10 - 100 - 1000 log messages! In our testing at Cypress the CI test log output was overwhelming CircleCI and TravisCI UI, and we could only download the raw text file if we wanted to see it! But if we disabled the log messages, when a test failed we had absolutely no idea what went wrong, which is also not good. Locha gives you a happy compromise. It runs all your tests with minimal default logging, but if any test fails, it reruns the failing tests only with extra environment variables. Take a look at this test file. Do you see two test runs? First one executed two unit tests, and only the console.log statements were visible. During the first run, test "B" failed, and Locha has executed just this test in the second round. During this round Locha has added the environment variables we have passed as a CLI flag --env DEBUG:failing to the mix. Thus the second round is pretty "loud", and allows us to debug the failure, or at least get an idea why it happens.